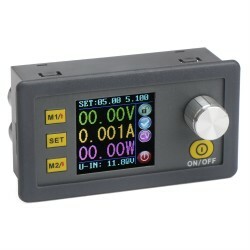 It is a Digital Meter Multimeter 4in1 Voltmeter/Ammeter/Power Meter/Energy Meter, 6.5 ~ 100VDC, .. It is Power Adapter Adjustable Voltage Regulator, Output Power: 30W max, Output Current: 1.5A, 3A Ma.. It is a 30W Adapter/Power Supply Module/ Adjustable Voltage Regulator, Input voltage: DC 5~32.0V (we.. It is a 360W Power Supply Module/Car Adapter, Input Voltage: DC24V, Outpt Voltage: DC12V, Output Cur.. It is a 36W Power Supply Module/Car Converter/Power Adapter, Input voltage : DC 22~60V, Output volta.. It is a 36W Power Supply Module/Voltage Regulator/Car Adapter, Input voltage : DC 15~55V, Output Vol.. It is a 37.5W Car Adapter/Voltage Regulator/Power Supply Module, Input voltage: DC 8~35V, Output vol.. It is a 400W NC Power Supply Module/Charger, Input voltage range: DC 6~65V, Output voltage adjusting.. It is a 40W Adapter/Power Supply Module/Power Converter, Input voltage: DC 12/24V (9V~35V), Output v.. It is a 40W Power Converter/Power Supply Module/Adapter, Input voltage: DC 20V~75V, Output voltage: .. It is a 4in1 Multifunction Voltage Regulator/Power Supply Module/MPPT Solar Controller/Power Adapter.. It is a Car Adapter/Power Supply Module/Charger, Input Voltage: DC 4.5~24V, Output Current: 3A max, .. It is a 50W Car Converter/Power Supply Module/Power Adapter, Input voltage: DC 12V/24V (DC 8~40V), O.. It is a 50W Power Adapter/Voltage Regulator/Car Converter, Input Voltage: DC 60V(8V~75V), Output Vol.. It is a 530W Step Down Converter/Voltage Regulator/Car Adapter, Input voltage: DC 48V (wide voltage ..